Halloween is my first major holiday as an ESL teacher. The student’s knowledge of the holiday is limited as Indonesia doesn’t celebrate it and only English language schools hold any sort of activity for the holiday. My school did a horror movie night for the students. I was quite surprised at the choice in movies. It was a Thai movie rated PG-13 and we had some students that were quite young. My more conservative, U.S. raised self kept thinking how stupid it was to show the kids this movie but then when I looked around the room at the young children closing their eyes and then bursting out in laughter when they get spooked, I thought to myself, no this is what Halloween is about… getting scared. If they watch some corny children’s Halloween movie that isn’t going to leave any lasting impression. Some my most vivid memories from childhood are from watching scary movies that were meant for people much older. The only bad part about this movie was that the subtitles were translated from Thai into Indonesian and then into English. This made for terrible grammar at the bottom of the screen. Even my students recognized how bad it was, which is a good sign that they have a pretty good grasp of grammar and the arrangement of the words to make coherent sentences. Said scary movie. 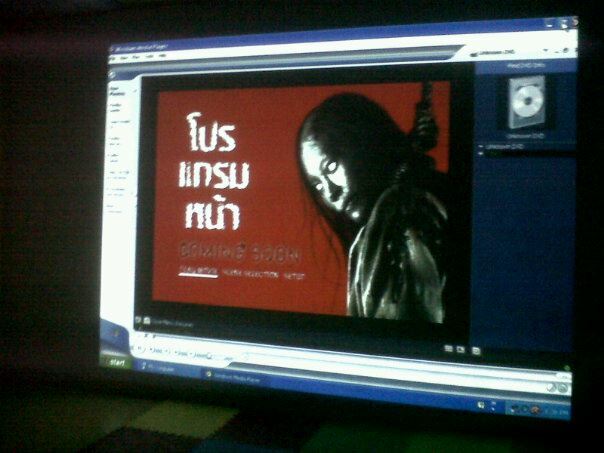 The Thai writing makes it even that much scarier. On to my quick ESL activity. This doesn’t have to be for Halloween but you can use a theme anytime you want. At my school there are guidelines to follow for lessons that must be completed by the end of the term. Depending on how far along I was in the class dictated whether or not I did some of the regular lesson or not. Some of my classes have very little to do by the middle of December so I was free to take up the entire class time with fun stuff. This isn’t a very complicated activity as it was my first attempt at putting something together for a holiday. For my younger students I printed out a pretty simple Halloween crossword puzzle to take up about 10 minutes of time and then we went through it together and I elicited the answers and explained some of them in more detail. They understood most of it but words like, “tombstone” and “mummy” needed more explanation. We talked a bit about trick or treating and some of the students already knew what it was and a few were in shock as another student explained the wonder that is dressing up in a costume and going door to door collecting candy. I really feel bad telling them about Halloween and seeing how disappointed they feel when they can’t enjoy the same thing here. While the students were doing their crossword I was busy setting up the whiteboard for the Word Find game. I drew a few Halloween pictures on the board, including a jack-o-lantern. Then I wrote some of the rules to the game on the board. We’ve all played the Word Find game at some point in our childhood but this is my variation. You write a word on the board like, “FRANKENSTEIN.” The students then have 2 minutes to write as many words as they can make out of that word. The students get a point for each word with 3 or more letters. If they find a word that is 5 letters or more long then they get 2 points. 2 letter words are not worth any points. This works best in groups of 2-3 students. I have each team get out one sheet of paper and pen and have them share the list and add to it as they go along. I then go around and check the lists for points and leave a check mark next to the ones worth 2 points. I leave it up to the honor system for students to keep track of their points from round to round and report after each round how many points they’ve earned. After about 2 rounds I then add an extra element to the game called, Joe’s Secret Word. I pick out a word that is at least 4-5 letters long that if they find it they get bonus points ranging from 5-10 points. This is a good way to even up the scores if one team is way ahead. It’s up to you if you want to be an honest teacher and think of the secret word before and not change it or pretend a word on the losing team’s sheet is the secret word. This works OK for the younger students as it keeps things close if one team is too dominant. The older students may catch on to your scheme. You don’t want to get caught cheating! These are some of the words I used for the game.